This is the FULL EXAM ONLY for those of you who already own the DVD. See below to purchase individual exams a la carte. 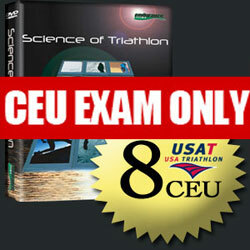 Examination: This full exam is based on the information presented in the "Science of Triathlon" DVD series. Upon completion of your order, you will receive an email with a link to download your test in pdf format. Instructions on test submission will be included on the pdf. Each test will comprise of several short answer questions based on the lectures within the "Science of Triathlon" dvd series. Credit will be granted to passing grades of 70% or higher.